Tradition and Innovation – The Inspiration and the Goal. 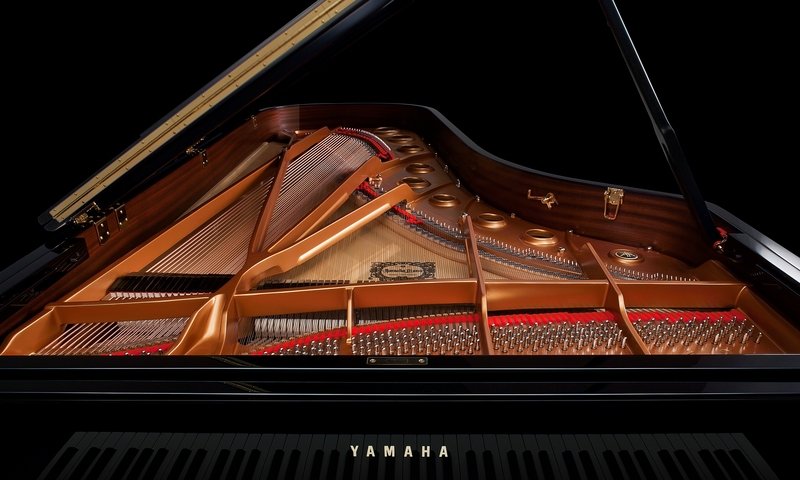 Seeking to offer artists better sound, Yamaha designers set out to remove any superfluous elements in what eventually became a complete reconstruction of the piano, redefining the relationship and balance between every part of the instrument. Their efforts gave the CFX the dignity and grandeur appropriate to a full concert grand, with a silhouette that projects its presence to the furthest reaches of any concert hall. 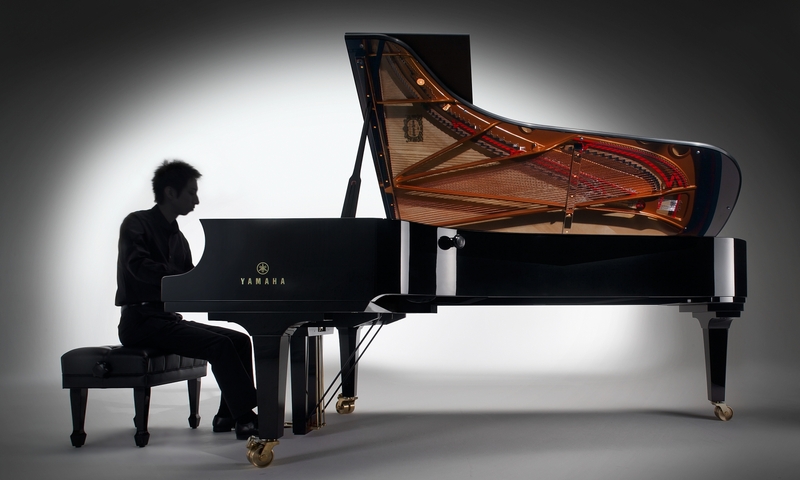 The CFX offers performance characteristics expertly honed to allow the pianist complete freedom of expression. All extraneous elements have been eliminated from the keyboard area, and a tranquil finish given to the inner surfaces, while the pedal box features a new construction capable of handling even the most tempestuous of passages. This combination actually serves to heighten the senses of pianists as they play. 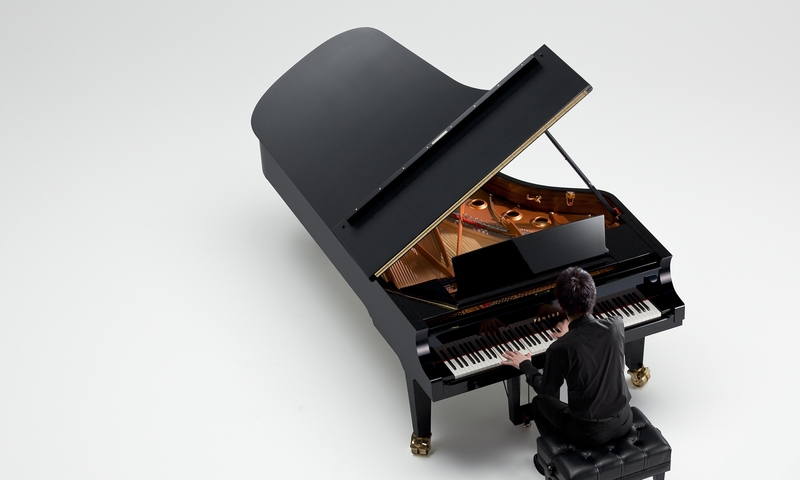 Aiming to combine the traditional construction of the grand piano with innovation that only the CFX would be able to offer, Yamaha designers sought a new conformation for the new instrument. The result is a modern configuration that combines sweeping curves and straight lines. The unique shape of the keyboard arms is symbolic of the innovation that the CFX embodies, and elegantly emphasizes the form and fingers of the pianist. Tasked with crafting a frame capable of creating the beautiful, powerful tones demanded of the CFX, Yamaha designers had to recreate the piano not just from an acoustic standpoint, but also from the point of view of construction. Seeking a clear sound with strong reverberation they consulted with pianists as they worked to develop a frame that would take into account both the flow of sound, and the forces exerted on the frame itself. Finished with precision by skilled artisans to a pure midnight black, the mirrored surfaces of the CFX possess a depth that lends the silhouette an air of carefree elegance and power. The lid has been finished with a half-gloss to prevent it from reflecting light when performing with an orchestra, while offering a beautiful contrast with the mirrored surfaces of the piano case. Capturing "Beauty and Power" in a Design. To a pianist, a full concert grand piano is the ultimate tool for expressing oneself through sound. To the audience, it is a unique instrument, stately and dignified; the sight of a pianist performing with a full concert grand, or perhaps even commanding an orchestra, offers a visual impression unique to the grand piano, and is an integral part of the musical experience of going to a concert. 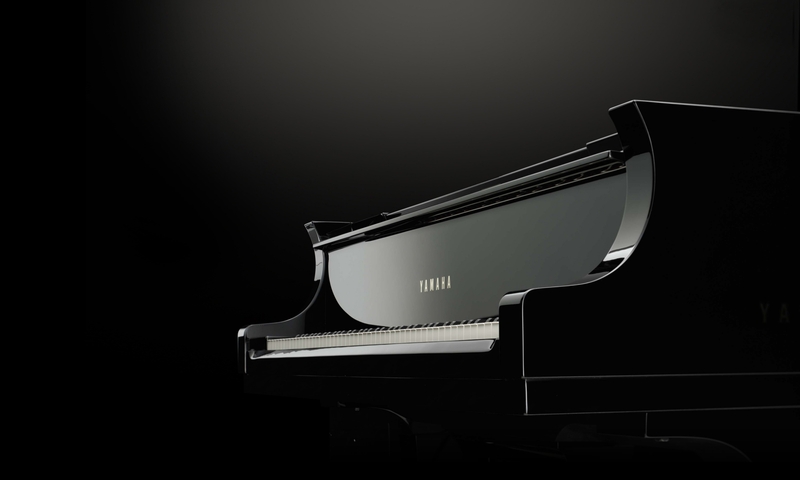 When designing Yamaha's new concert grand piano, we aimed to emphasize the essential appeal of this magnificent instrument by honing its essential functions, and showcasing the innovations that it possesses as a modern piano. We strove to, and succeeded in, creating an identity that achieved both goals. 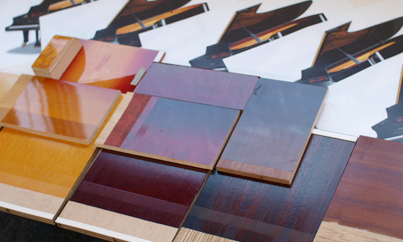 Until now, we had refrained from making any significant changes to the fundamental construction and shape of the piano, due to the fact that every element in construction of a true concert grand piano has a direct effect on the sound. However, in designing the CFX, we wanted to break away from the fixed ideas and styles of traditional grand piano design to achieve the ultimate in performance characteristics, while still retaining a respect for the long history of the piano. 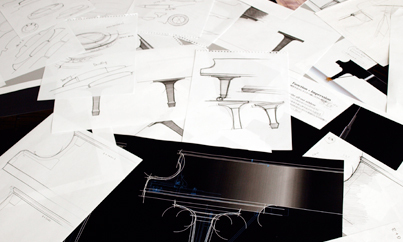 Engineers, artisans, and designers worked together to bring to bear knowledge and techniques accrued over many years to contribute to this innovative design process. 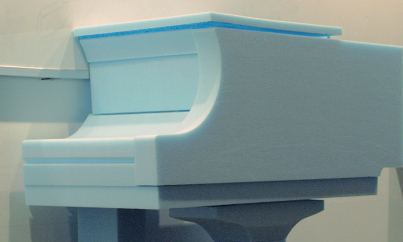 One example of this is in our belief that the sound "travel" that takes the beautiful sound of a piano to the furthest corners of a concert hall is unified with the "travel" of a design, which is why we gave a powerful, clear shape to the sides of the CFX. 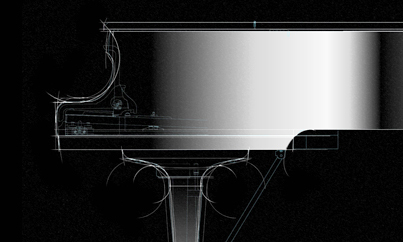 At the same time, we heightened the unity of the shape of the sideboards, keybed, and legs to create a unique silhouette that steps well beyond the norm for a conventional concert grand piano. The pedal box, so essential to a pianist’s musical expression, features a new configuration of a box supported by two legs. This affords it the strength to remain firm even if the pianist presses down with all their strength, while giving it a bold new look that further complements the modern design of the new CFX. Sweeping changes have also been made to the frame at the heart of the instrument’s sound. We looked in detail at the shape of the ribs and the tone holes and at the connections between each component element, with an emphasis on tone and the flow of sound and power. The result is a beautiful, powerful frame that gives life to the CFX’s "Beauty and Power" concept. This is a instrument that affords the pianist the highest level of musical expression. 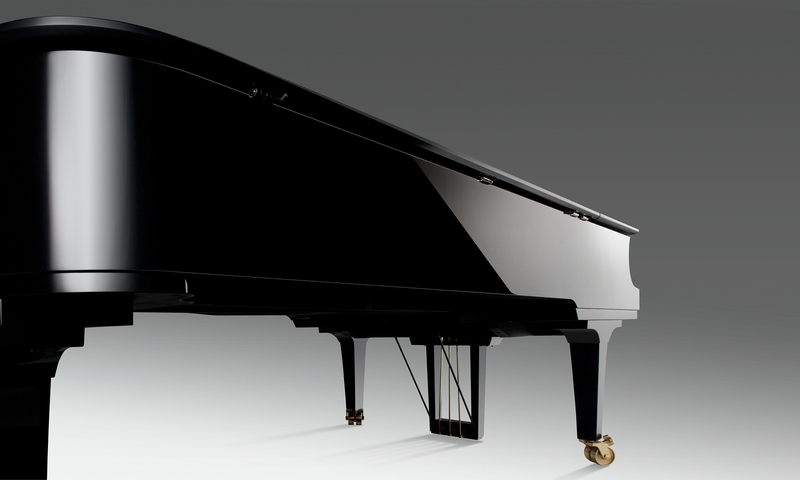 In this design, we offer a new incarnation worthy of Yamaha’s new flagship model concert grand piano, the CFX.